None of these tips alone are worthy of an entire blog post, but all are little nuggets I’ve picked up either on the trail or reading various books, magazines or blogs. Enjoy! 1. If you are going to use those dehydrated meals that are cooked by pouring hot water into the package, consider this weight (and space) saving plan. Open all your meals except one ahead of time, and pour the contents of each into the smallest paper bags you can manage. If you can’t find a small enough one, cut a larger bag down to size; apply a little tape to secure the bag. Then, on your first night, use the meal in the original packaging. On subsequent nights, poor the contents of one of your paper bags into the “cook-in” bag you used on day one. Replace the “cook-in” bag at each resupply point. 2. I never carry a wallet with me on the trail, but I do take a few things out of it for the hike. First is a photo ID, preferably a driver’s license. You’re probably not planning to rent a car somewhere between the beginning and the end of the hike, but bailing halfway can happen, and the ability to rent a car can sometimes make getting around easier. Second is your medical insurance card, for obvious reasons. Third is a credit card. If you are sharing an account with a spouse, take a card from a different account. That way if your spouse loses his or her card, and the number is canceled, it won’t affect the card you have. Last is some cash. You never know when it might come in handy, and a few $20 bills are awfully light! Duct tape on the trail has almost unlimited uses. 3. I picked this up on the John Muir Trail Yahoo Group a few months ago, and it is a gem: put a small pencil sharpener in your first aid kit or other emergency packet. If you find yourself in a situation where you have to build a fire under duress, it’s a great way to create small slivers of wood (using a pencil-sized branch), which will ignite easily. 4. An “oldie” but also very much a “goodie”. Wrap a foot or two of duct tape around the upper portion of your trekking poles. Duct tape is good for repairing ripped tents, tarps, and clothes. You can use it, combined with a sterile (or as clean as possible) cloth to form a bandage. It can be a substitute for moleskin if you are having blister problems. 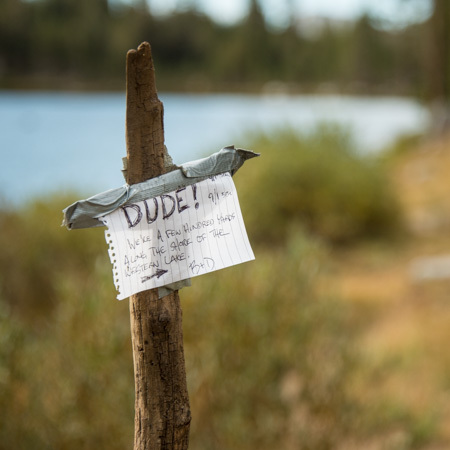 It’s also great for taping notes to signs for hikers who are behind you. (Just make sure those slow hikers grab the note and take it with them.) Last, you can even use it as an improvised tick remover. 5. On your first rest day, reevaluate how you are hiking your hike, and make improvements. If you are hiking southbound, many folks will take a zero day at Red’s Meadow. On the evening you arrive, carefully evaluate what is working and what you could do better. If you need to get rid of some gear, the Mammoth post office is about an hour (and two bus rides) away. Mammoth also has several great outdoor stores, in case you want to replace or supplement what you’ve carried thus far. If nothing else, at least take a close look at how you are packing your backpack and make any adjustments necessary. Good tips, indeed, Ray! Just got off the trail from our SOBO hike. Regarding tip #1…we contacted one of the dehydrated dinner mfgrs. regarding this idea; not good they said, especially those containing meat! Once opened, the meal starts to rehydrate and could start to go bad. Also, re-using the “cook-in” pouch could lead to some potential stomach/intestinal distress if any little particles of left-over food start to “grow”. Best to boil a few extra ounces of water and give the pouch a little extra cleaning after the meal or before the next one. Some meals seem to have more “air” in them than others, taking up more space. When we picked up our cache at Red’s and MTR, we punched a small hole (above the water line!) with a pin, forced out the air, then sealed the hole with a piece of tape which we had previously stuck to the lid of our canister. Saved all kinds of space. Just don’t do this to the meals you have to send in your cache weeks ahead! Have a great hike! Water was plentiful and the mozzies were almost nonexistent! The wildflowers were out in full force!!! Interesting point, Rick, and logical. I have never had a problem, but then that doesn’t prove a thing. Thanks for the comment! All good points but if I may add to the dehydrated meal one. I repackaged all of my meals in Zip-Loc zip-n-steam bags so I didn’t have to re-use bags and cross contaminate. They could take the heat and hot water no problem and were less bulky than the original packaging. Good tips all the way around……. I’m not sure I have ever seen “Zip-Loc Zip-N-Steam Bags.” I need to look for those little guys! Thanks for the comment, Chad. Thanks for the comment, Richard. Were those little can openers call “P-38s?” Rings true for some reason. Should be able to find them in military surplus stores, they were gov’t issue originally…but haven’t seen any in a long time (I don’t regularly shop at military surplus stores). Maybe hunting/gun shops? Seems the sort of thing hunters might carry for similar purposes as long-distance hikers. Also maybe where you find scouting supplies, those guys are avid outdoorsmen. Never joined the Boy Scouts myself, but always envied my brother’s adventures when he was a scout….I opted for sports. I have made my own meals using quart freezer zip lock bags. Pour in boiling water and let sit in my cozy until hydrated. Works great and after hundreds of meals I have not had a leak. When I retire I intend to learn how to dehydrate and make my own meals. Sounds great! Thanks for the comment, John. Ray, Thanks for the tips. I really enjoy your weekly postings. I have a couple of questions for you. I will be doing an eleven day section hike starting August 27, and am still a little unsure about packed clothing for that season in the Sierra. (I am from the southeast USA) Could you post what your clothing list will be for the JMT this year? Thanks for the kind words regarding the blog, Jim. Here is my approach to clothes: I need to plan for four scenarios: walking in normal weather, walking in inclement weather, hanging out in camp, and sleeping. My goal is to be comfortable with each and to double-up stuff as much as possible. For walking I use hiking pants and a long-sleeved Patagonia Capilene 2 tee-shirt. I carry one spare of each because I like changing clothes a couple of days before heading in for a zero day (or at the end of the trail). Changing into clean clothes, for me, is a real treat, and I hate looking like a bum when I arrive to civilization. For hanging out at camp I have a collared hiking shirt (REI) and a fleece jacket. The shirt is enough if I am moving around, but the fleece is usually necessary if I am sitting. I would like to replace the fleece with a really light down jacket. For inclement weather I have cheap rain pants and an expensive rain jacket. For in the sleeping bag I have silk-weight long underwear and socks which are only worn in the bag. Of course, if it gets cold in the bag, I can add the fleece or even the rain gear (assuming it’s dry). Many would say that this is too much. The second set of clothes and the collared hiking shirt could certainly be left behind without compromising safety or comfort. In almost all cases I do not remove my bear canister. Does it smell like food? Sure does, but, you know, so does my backpack, my clothes (where one inevitably spills stuff), and probably me. Sierra Nevada black bears, in general, have no interest in getting close to people. There are some places, however, where bears are have gotten so comfortable with people (like near Yosemite Valley or Little Yosemite Valley) that I might consider removing the canister, mostly to save my backpack from being damaged. The truth about Yosemite bears is this: if Mr. or Mrs. Bear wants to check out your backpack, your canister, your car, or you, there is nothing you can do to stop them. Bear canisters work in Yosemite not because they deter the bear; they work because they eliminate the reward for ripping into cars or backpacks. In a sense it is all about behavior modification, not security. I have seen five bears on the JMT, and all five were within YNP.